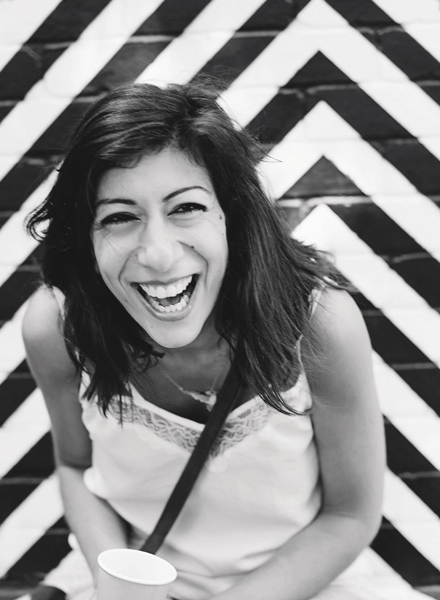 And even though all these things are exciting and fun, today has been a really lovely calm day, I got a chance to thoughtfully cook myself lunch (and shoot it) before leaving the house and Skype my best mate in Spain – I miss her bad. It feels so good to actually take the time to think about what I need, and want. I’ve been trying hard to make sure we regularly eat fish for some time now as it is such a quick and nutritious source of energy and omega 3’s – proper brain food. However being a Monday fresh fish isn’t really an option, so I went for the smoked kind instead, which is a brilliant fridge staple. 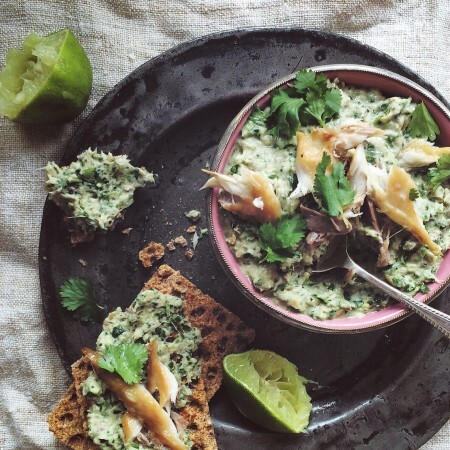 I wanted to continue with the wholesome route and decided to make a spiced mackerel pâté , one that is full of flavour and goodness too, and lighter than the normal kind. And even though I can be a bit of a purist (no horseradish or cream cheese?!) I can report it was delicious, insanely quick and easy to make and made a perfect light lunch. It was great for me on my tod (with the leftovers stored in the fridge when I need another hit), but equally it would make a top dinner party appetiser too. Roughly chop the chilli, ginger and spring onions and place into a food processor with most of the coriander, spinach and black pepper. Blitz until everything is finely chopped then add the yoghurt, fish sauce and squeeze in the juice of the lime. 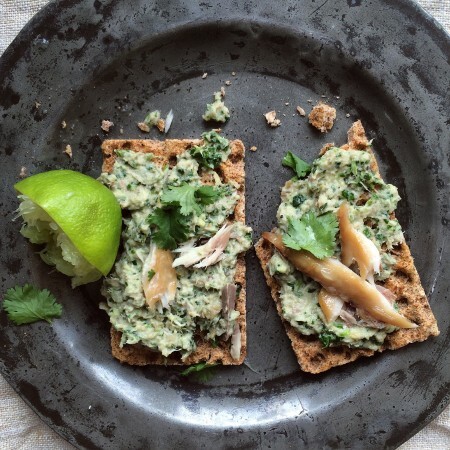 Flake in almost all of the mackerel (discarding the skin) and blitz just enough to bring the pâté together – you want it to be creamy but still have a little texture. Adjust the seasoning, adding a little more fish sauce or lime if needed, then decant into a bowl. Garnish the pâté by flaking over the reserved mackerel and sprinkling with coriander leaves, and serve with crisp breads and crudite.